Choose up to 5 free offers and up to $200 onboard credit per stateroom. With a value up to $2,8000, don’t miss out! Book a Studio or Inside Stateroom and can choose 1 Free offer, or choose 2 when booking an Oceanview, Balcony or Mini-Suite and best of all, book a Concierge Accommodation, Suite or The Haven and you’ll receive all 5 offers! Plus, receive up to $200 Onboard Credit per stateroom. When you cruise with Norwegian, you’re free. Free to dine, dance, laugh, explore and relax – free to follow the sun instead of a schedule. Norwegian’s award-winning ships are designed for you to enjoy as you choose while cruising to beautiful destinations around the world. Along your journey, you’ll discover incredible culinary experiences with the freedom to dine when and where you want. Light up your nights with the best entertainment at sea. Savor handcrafted cocktails at your favorite bar or lounge or simply relax and do nothing at all. Take to the sea and find out what it means to Feel Free. And, Norwegian’s Free at Sea promotion lets you choose up to 5 fantastic, FREE offers*! Per person, double occupancy in a Balcony stateroom. 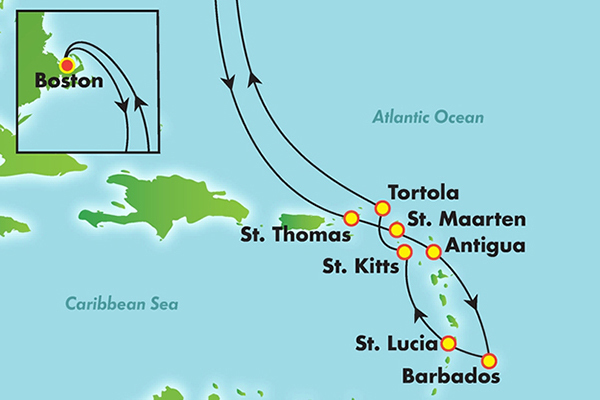 This unforgettable weeklong vacation cruises to the best ports in the Western Caribbean. 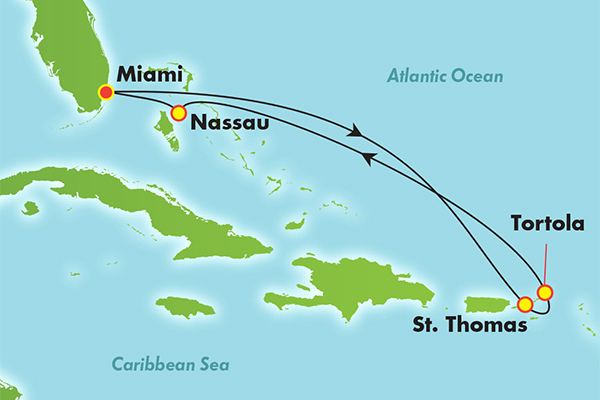 Island hop the Eastern Caribbean and discover crystal blue waters and perfect sunsets. 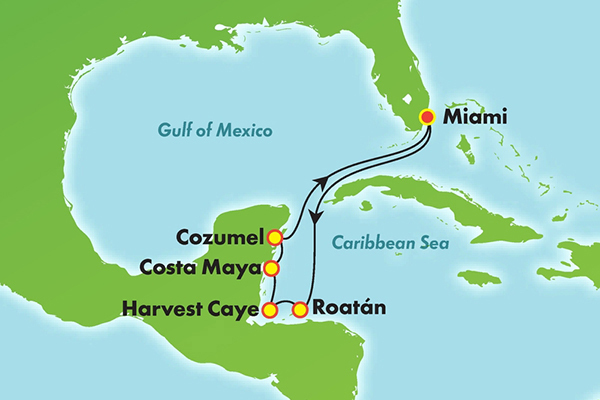 Explore all the beauty of the Southern Caribbean of this two-week sailing where you can hike, swim, snorkel or just relax at your own pace. *Valid on 3+ night sailings. Free at Sea choice(s) must be selected at least 24 hours prior to sailing and cannot be changed on board. Haven, Suite & Concierge bookings receive 5 offers; Oceanview, Balcony & Mini-Suites choose 2; Studio & Insides choose 1. Gratuities, Beverage and Specialty Service Charges may apply. Significant details and limitations apply to Free at Sea offers: Free Unlimited Open Bar, Free Specialty Dining Package, Free WiFi, Free Shore Excursions, Friends & Family Sail Free (on select sailings). Bookings made within 24 hours of departure must select choice(s) at the time of booking. Pricing is per person based on double occupancy and is subject to change. Not applicable to categories IX, OX, BX or MX. Offer is capacity controlled and can be withdrawn at any time. Singles paying 200% of voyage fare qualify. Anything consumed above the promotional benefit will be the responsibility of the guest at prevailing rates. Guest cannot substitute or customize this offer. All guests in stateroom must choose same offer. Government taxes, port expenses & fees, discretionary onboard service charges and/or gratuities are additional. Cancellation Fees also apply based on the booking/sailing date; therefore, Norwegian Cruise Line strongly recommends the purchase of travel protection on all bookings. This is a cruise only offer. This promotion is not applicable on the land portion of Cruisetours or bundles. No components included in this offer have any monetary value, are non-refundable and non-transferable. Offer and combinability with other promotional offers is subject to change at any time per Norwegian Cruise Line’s discretion. Other restrictions may apply. Norwegian Cruise Line reserves the right to cancel or withdraw this offer at any time. Pricing is per person based on double occupancy and is subject to change. For full terms and conditions please contact your travel professional. © 2019 NCL Corporation Ltd. Ships’ Registry: Bahamas and USA.